We use a proprietary algorithm for this application. PLEASE CONSIDER THIS APPLICATION FOR ENTERTAINMENT PURPOSES ONLY. DO NOT CONSIDER IT A RELIABLE SOURCE for seeing into you or the future. Perfect for breaking the ice. Palmistry is a practice originating in the Far East. The practice of palmistry has been used in the cultures of India, Tibet, China, Persia, and some countries in Europe. 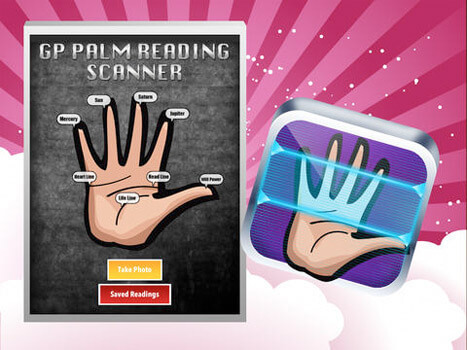 Studies show that most ancient communities like the Hindus, Sumerians, Tibetans, Hebrews, Babylonians, and Persians were greatly interested in the study and practice of palmistry. The heart line is the first of the major lines examined by a reader and represents love and attraction. It is found towards the top of the palm, under the fingers. In some traditions, the line is read as starting from the edge of the palm under the little finger and flowing across the palm towards the thumb; in others, it is seen as starting under the fingers and flowing toward the outside edge of the palm. Palmists interpret this line to represent matters of the heart, that is, more literally, our emotional living; it is therefore believed to be an insight into how the emotional sides of our mind frames will act out and be acted upon during our lifetimes. The life line is perhaps the most controversial line on the hand. This line extends from the edge of the palm above the thumb and travels in an arc towards the wrist. This line is believed to represent the person's vitality and vigor, physical health and general well being.